This weeks Challenge is Conflict and I’ve decided to talk about the toll that war took on my family. War is such a destructive process – of lives, culture, freedom. World War I and World War II were the most destructive in recent history – they wreaked havoc on the Australian male populations and of future generations. Australia had a population of approximately 5 million when WWI hit, of those 416,809 men enlisted – 8% of the overall population.1 Of these 60,000 (14% of enlistments) were Killed in Action or died of their injuries, and 156,000 (37% of enlistments) more were wounded – all the ones who returned would suffer psychological trauma with what they had been through.1 For such a small country we paid a large price. 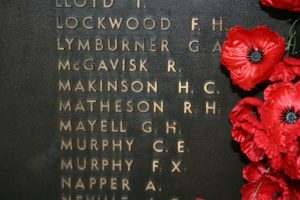 My Australian family, like many others, suffered casualties in these conflicts. My great-great-uncle Robert Hilton Matheson (known as Hilton) was born 21 July 1892, the youngest son, and second youngest child of Robert Matheson and Edith Ford.2 He was K.I.A. on 23 May 1918, aged 25 years.3 His family were devastated as their dreams for him dissolved in a conflict so far away. They named their home “Hiltona” in honour of him. You can read more about Hilton in Week 21 – Military. Hilton’s younger sister Gladys Gwendoline Matheson married Fletcher Alderwin Brand on 10 June 1920 in Victoria Park, Western Australia.4 Fletcher enlisted when he was 33 years old and survived the war, however, he was plagued by his war injuries.5 He received a war pension as a result of his service.5 You can read more about Fletcher in Anzac Day. Meanwhile Gladys and Fletcher were praying for their eldest son Alywin Robert David Brand who was serving in the war to return to them safely. They tragically lost their other two sons, Donald Raymond Brand and Hilton Dudley Brand (named for his Uncle Hilton), in separate, non-war related accidents in 1944. These conflicts stole so much from my family – the hopes and dreams of their parents. The spouses and children they might have had. The younger generations getting to know their fathers, brothers, uncles. Such a terrible waste. Click on the image below to learn about your military ancestors. 1. Australian War Museum, ‘First World War 1914–18’, awm.gov.au/articles/atwar/first-world-war, Accessed 11 November 2018. 2. Ancestry.com. Australia, Birth Index, 1788-1922 [database on-line]. Provo, UT, USA: Ancestry.com Operations, Inc., 2010, Robert H Matheson, 1892 Reg. No. 6475, Bathurst, New South Wales, Australia. 3. National Archives of Australia, ‘Service Record of Robert Hilton Matheson’, NAA: B2455, Matheson R H, Accessed 2 September 2016. 4. Marriage Index, Fletcher Alderwin Brand and Gladys Gwendoline Matheson, 1920/673, Registry of Births, Deaths, and Marriages, Western Australia. 5. National Archives of Australia, ‘Service Record of Fletcher Alderwin Brand’, NAA: B2455, Brand F A, Accessed 20 September 2016. 6. 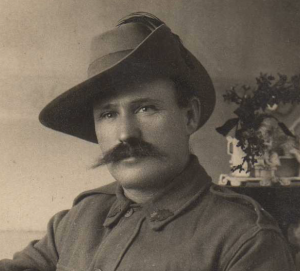 Australian War Memorial, Kenneth Norman Hilton Butler, Roll of Honour, R1690166, https://www.awm.gov.au/collection/R1690166, Accessed 28 March 2018. 7. Australian War Memorial, K S Lance, Service Number: WX15951, Prisoner of War Record, https://www.awm.gov.au/collection/R1452422, Accessed 20 April 2016.